• Subterranean – will usually build their colony underground, under patios and base of trees. Will build mud leads and underground tunnels. • Dampwood – will usually build their colonies in timber landscaping, damp subfloors or damp wood. • Drywood – will usually be found in tropical climates, will nest in drywood and does not need ground contact. Different species prefer different habitats such as Subterranean termites like soil and ground contact. They tend to build their nests underground. 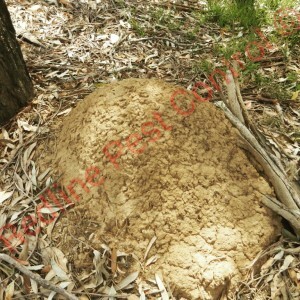 Subterranean termites can also create termite mounds that go above ground level. 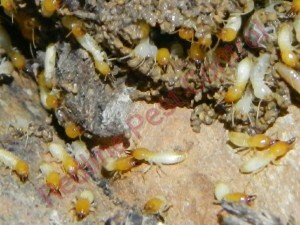 Mature colonies may reach up to two million individual termites and the queens are capable of laying 2000 eggs per day. Termite colonies can exist up to 50 years. 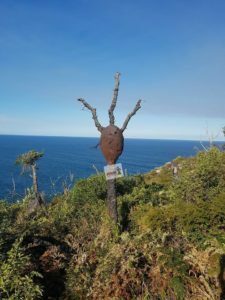 The Worker termite will dominate the colony population as their primary role is to build the nest, tend the eggs and young, and gather the food for the colony. Worker termites are wingless, sterile, and blind. The Soldier Termite is also wingless, sterile, and blind. 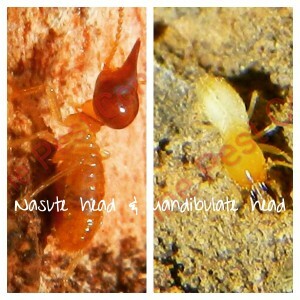 There are two types of termites, Mandibulated with prominent jaws and the Nasute with a pronounced snout. Their primary function is to defend the colony. The Reproductive termite has a functional reproductive system complete with wings and eyes. 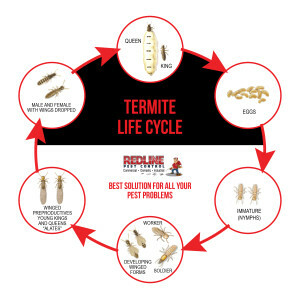 Termites will usually swarm around spring to early summer or late summer to early autumn. After swarming the termites will seek out a suitable place to form a new colony. The king shape really doesn’t differ but the queen’s abdomen becomes enormously distended with eggs. termites also known as the silent destroyer, they can cause serious structural damage to your home or business. Termites can conceal themselves provides the perfect amount of time to cause considerable damage before they are discovered.